We had another BEAUTIFUL day in Glasgow today. Up to 17 degrees!! Sun, blue sky. Having a rather rubbish work day, I escaped my desk for a walk in the sun at lunchtime. Light coat and no boots but light shoes!!! What a difference. A lot people where around enjoying the sunshine. I got some fresh coffee and some (ridiculous expensive) rhubarb on the way home and jumped back into calls. We have some annoying situations to deal with and it's no much fun. The time change last weekend fooled me. I thought it was much earlier in the day as there was still daylight! I worked until Neil came home, but all in all the issues are not solved yet - not my happy work place! However, despite the lovely sunshine I did not take many pictures at all. 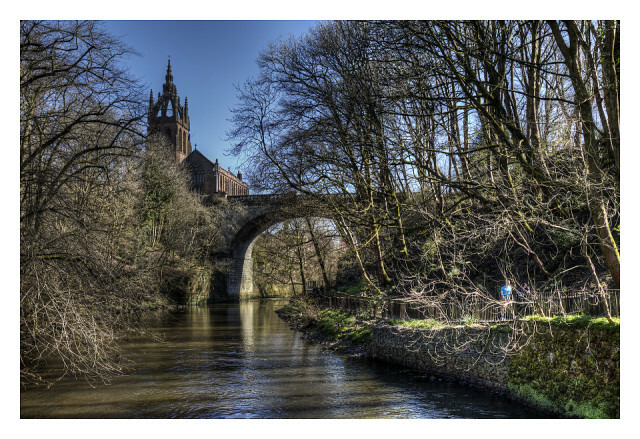 Today's blip is a view over the river Kelvin along the Kelvin Walkway.